14mm Amber Glass Skillet. 5". 1ct. ..
14mm Clear Glass Skillet. 5". 1ct. ..
14mm Green Glass Skillet. 5". 1ct. ..
19mm Amber Glass Skillet. 5". 1ct. ..
19mm Green Glass Skillet. 5". 1ct. 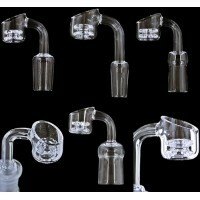 ..
45 Degree Quartz Banger. Available in 10mm, 14mm and 19mm. 1ct. ..
4mm Heavy Quartz Banger Nail. Available in 10mm, 14mm and 19mm. 1ct. ..
19mm On 19mm Oil Dome With Step Male Adapter And Glass Nail. 5ct. ..
Diamond Knot Quartz Banger. Available in 14mm and 19mm. 1ct. Improved Heat Retention Buit-In..
Quartz Banger Nail. Available in 10mm, 14mm and 19mm. 1ct. ..
Reacter Banger Quartz Nail. Available in 14mm and 19mm. 1ct. X Air Slit Reacter Chamber 5m.. Thermal Quartz Banger Nail With Carb Cap. 1ct. 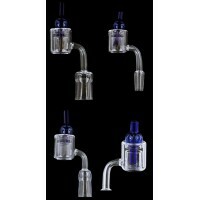 High Capacity Chamber Improved Adjustable Air..
10ml Glass Concentrate Ultraviolet Protected Jar. 10ct. ..
14mm Glass Nail. Color May Vary. 10ct. ..